I've watched a lot of Source Filmmaker stuff over the years. I've seen the trailer for End of the Line about a hundred times. But now the full thing is out, and it's good. It's really good. 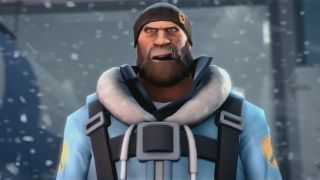 The community film was directed by James McVinnie, and releases alongside an End of the Line themed TF2 community update—containing hats, a new weapon and some new unusual effects. I'd give a summary of the film, but why ruin the surprise? It's got a train in it, if that helps. It's also got a very distinct tone. The zanier edges of the TF2 roster have been sanded away, leaving a relatively dramatic piece that nevertheless contains more than its fair share of comedy. Set aside 15 minutes and enjoy one of the best SFM films we'll likely see for a while.